[APRIL 5, 2006] Even though new Abraham Lincoln Tourism Bureau of Logan County director Geoff Ladd took the helm at the end of the main tourism season last year, there was not much time for sitting. Ladd came in less than two weeks before the 35th annual Abraham Lincoln National Railsplitting Contest in mid-September. Even though it has been the slow season for central Illinois, things have not slowed down in his office, Ladd says. There is a lot going on here, he said. Over the winter, Ladd spent time building essential relationships and strategizing with local groups to promote the major strengths of the area. Additionally, he's been getting the new office -- located in the "Information Station" at Route 66 and Fifth Street -- in order, looking for grants and networking within the industry to bring more people to Logan County. Ladd says he sees this as an important period in Illinois' tourism history, with the opening of the Abraham Lincoln Presidential Library and Museum. It is important for Logan County to take advantage of the opportunities that it offers. Before even coming to Logan County, Ladd could see the potential the county holds: the Abraham Lincoln connection, the new Route 66 National Scenic Byway, "That is going to be a huge deal for Logan County," he said. "We have so much great Route 66 stuff." The county has a variety of accommodations to offer -- good motels, business and meeting convention centers, and sports facilities -- making it a prime place to host events. Lincoln College, Lincoln Christian College and the Lincoln Recreation Center have graciously offered their resources to enhance conferences and conventions. Two new national events were hosted here in the last year with great success: a college volleyball tournament and a national dog show, the Chihuahua Special. Then there is also the railsplitting competition. In addition, the fairgrounds hosts many events, including the annual Logan County Fair, large craft shows and other attractions, and weekly seasonal car racing. Early this year Ladd saw the start of what he hopes will become many highway signs going up and down the Interstate 55 corridor from St. Louis to Chicago -- signs that will draw people into Logan County towns. He said he even hopes to see some signs go up on I-155. The first two signs are on either end of the county, at Atlanta and Broadwell. They feature a combination of Looking for Lincoln and Historic Route 66 emblems. Both are historic Illinois Heritage projects that Logan County is fortunate to be able to claim, Ladd said. "We are one of few counties in Illinois that you can go from one end to the other and stay on Route 66 the whole time," he said. This section features the only stretch of the original single-lane roadway, located behind Graue Chevrolet, and the lost bridge, going over Salt Creek by the Lincoln Sportsman Club. 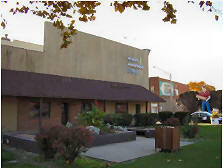 Historic Route 66 also passes or is within blocks of a number of museums and historic sites. Looking for Lincoln has sites spread over the whole county where young lawyer Abraham Lincoln practiced law or stayed overnight with some frequency. Mount Pulaski, Lincoln, Middletown and Atlanta all host historical sites. The state has approved a new type of highway sign that is like the blue multiple fuel or food service signs, Ladd said. Interstate tourist exit signs have been approved by the state to mark communities with two to six sites. Exits that can list six sites are higher on the sign priority list. Ladd said that having two Illinois Heritage projects to participate in means that we'll be able to list more sites per sign and we'll be higher on the list to get signs first. For example the exit at Elkhart offers the most direct highway access to Looking for Lincoln and Route 66 sites in both Elkhart and Mount Pulaski. Elkhart has a direct route to Mount Pulaski via County Highway 10. The double community and multiple tourist sites will push their highway signage up on the priority list. Another tourism development under way is for a bicycle trail that would go the length of the county and connect with trails in McLean and Sangamon counties. This trail is planned to run from Chicago to St. Louis when completed. Funds were allocated by the Department of Natural Resources to perform a greenways study that will go into the Logan County Comprehensive Plan. The trail is at the top of the Logan County greenway priorities. A lot of work toward it has been done over the years, Ladd said. Ladd has spent time assessing sites along Route 66 that either need taking over soon or hold potential for development that would enhance the Logan County Route 66. Atlanta -- Community leaders have identified a professional building, across from the Paul Bunyan statue, that would make a great museum and visitor center. Broadwell -- Owner Ernie Edwards of the renowned Pig Hip Restaurant Museum enjoys his work, but, now in his 80s, he's ready to retire. Elkhart -- A Route 66 gas station that closed a couple of years ago could be reopened as a gas station and convenience store. 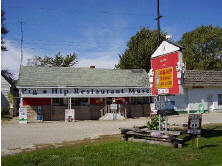 Ladd sees that it could be reopened with the possibility of a museum inside. Even the National Park Service sees it as a valuable location. 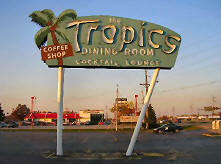 Lincoln -- The longtime famous Tropics property in Lincoln is up for sale. 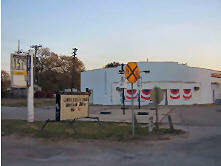 The property location offers high-volume traffic and great visibility. Lincoln -- The Mill restaurant: Ladd has offered to work with the owner on preservation and facade. The front portion may even be usable. Tear down the part that needs to come down and leave the front up. He's told the owner: I'll help you promote it as a Route 66 attraction. 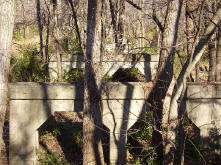 Lincoln -- Ghost bridge, located between the cemetery and the Lincoln Sportsman Club, just west of where the current Route 66 crosses Salt Creek south of town. This bridge holds potential if the bicycle and walking trail ever comes into play, Ladd said. Ladd serves on the Illinois board for Route 66. He has already submitted funding requests for the potential tourist spots he has identified. The facility is also the home of the Lincoln/Logan County Chamber of Commerce and the Lincoln and Logan County Development Partnership.